The 2012 annual Ministry of Law appreciation dinner was held on 18th Oct at the Singapore Marriott Hotel in conjunction with the Attorney-General’s Chambers National Day Awards Investiture. The event recognised Community Mediators who volunteer with the Ministry’s Community Mediation Unit , Assigned Solicitors who work with the Legal Aid Bureau to provide pro bono legal aid, as well as legal practitioners who have made significant contributions of expertise to the Insolvency and Public Trustee’s Office. George Hwang was invited along with 70 others to the dinner presided over by Minister for Law, Mr K Shanmugam. More than 20 awards were given out to volunteers, an increase, since the addition of new categories to the awards dinner last year . 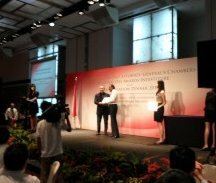 Among them was Professor Micheal Hor Yew Meng who was presented the Outstanding Volunteer Award for his contribution to various law reform projects involving criminal law and criminal practice. Other notable guests included Simon Chesterman, Dean and Professor of Law, National University of Singapore, Denis Croze, Director, World Intellectual Propety Office in Singapore and Colin Goh, Director, Ocean Butterfiles Music Pte Ltd. Guest dined on a sumptuous dinner entertained with “live” music from a string quartet.